If Thursday night’s Game 1 of the 2015 NBA Finals was an indication of things to come, then we better strap ourselves in. It’s going to be a wild ride. Four quarters and 48 minutes of regulation wasn’t enough to determine a victory, so the Golden State Warriors and Cleveland Cavaliers decided to provide fans with an extra frame for good measure. In the end, it was the best from the West that made the necessary plays, outscoring the Cavs 10-2 in overtime, and winning by a final score of 108-100. 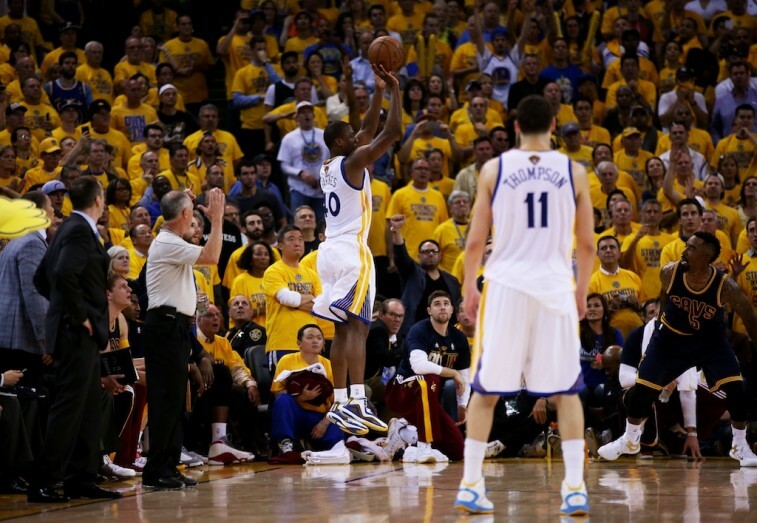 This back and forth affair had the spectators at Oracle Arena on the edge their seats. The Dubs showed tenacity, resolve, and a will to win. The Cavaliers certainly played hard. But the visiting team clearly ran out of gas toward the end of the game. Both teams had opportunities to close things out in regulation. Neither could get it done. No matter. After holding firm on their home floor, the Golden State Warriors now lead the series 1-0. But let’s be real. The real winners on the night were the fans. With star performances, clutch role players, and physical play, this first game lived up to the billing. And yet, some things managed to grab our attention more than others. 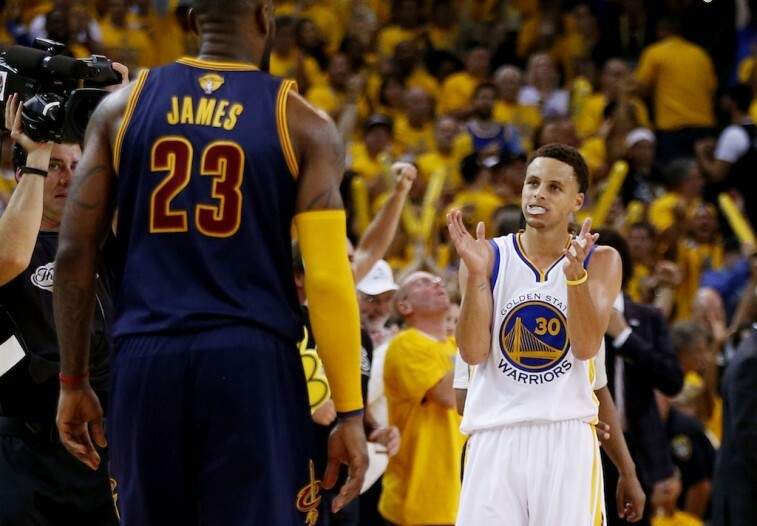 With that in mind, here are five takeaways from Game 1 of the 2015 NBA Finals. Kyrie Irving‘s health was a major question mark heading into the series. Folks wondered if an eight-day layoff would be enough to help him overcome what the team claimed was bout with tendinitis in his knee. 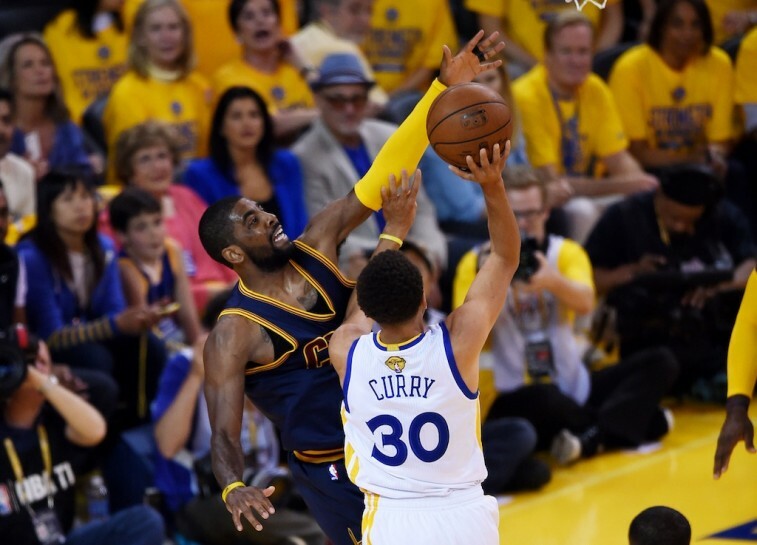 And for most of Game 1, Irving looked like the player most were hoping he’d be. His quickness was there. His shot was falling. He was using his crafty dribbling to get to the bucket. He filled up the stat line, with 23 points, 7 rebounds, 6 assists, 4 steals and two blocks. And his block from behind on Stephen Curry‘s potential go-ahead buck, with time winding down in the game, was jaw dropping. For the better part of the game, Irving looked like his old self. And then overtime happened. When the shifty point guard landed awkwardly in the extra frame, you could tell he re-injured his knee. An early diagnosis suggested there was no tear in the ACL or MCL. But after the game, you could sense his nervousness.”You can hear in the tone of my voice that I’m a little worried,” Irving said. “I just want to make sure everything is OK, and I’m going to take the necessary steps to see what’s going on.” We’ll have to wait for an MRI to know the full extent of the injury, but Irving did need the help of crutches after the game. Here’s to hoping this isn’t a terrible setback, particularly if Cleveland really did force him to play through something serious. What a devastating blow that would be. The Golden State Warriors may have superstar Splash Brothers Steph Curry and Klay Thompson, but this team is so much more. It’s insane to think about the overall depth of this roster. Harrison Barnes stepped up, providing 11 points, on 3 for 5 shooting from beyond the arc. Draymond Green contributed 12 points, Andre Iguodala had 15 off the bench, and the Warriors had five players in double-digit scoring. This team has so many weapons, that it’s almost unfair. On top of that, the Dubs are capable of beating you in so many ways. If the supporting cast continues to make its presence felt, then Golden State should like its odds even more. 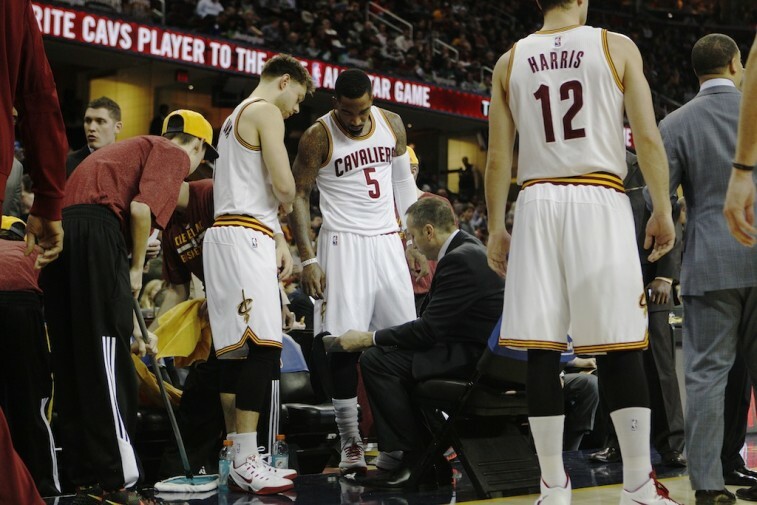 Speaking of supporting cast, the Cleveland Cavaliers bench was totally nonexistent. Aside from J.R. Smith, and his 9 points in just over 34 minutes of play, no other Cavs reserve put the ball in the basket. None. That is absolutely unacceptable. Matthew Dellavedova was terrible. James Jones missed his only attempt from the field. The Warriors bench outscored the Cavs bench 34-9. That cannot happen again. When you’re playing a team as talented as the Golden State Warriors, you can’t afford not to bring it every night. Granted Cleveland isn’t exactly at full strength, but that should be no excuse. This is the NBA Finals. Most players never get this opportunity. Now is the time to rise to the occasion. If Cleveland hopes to win this series, it’s bench has to perform. It’s just that simple. 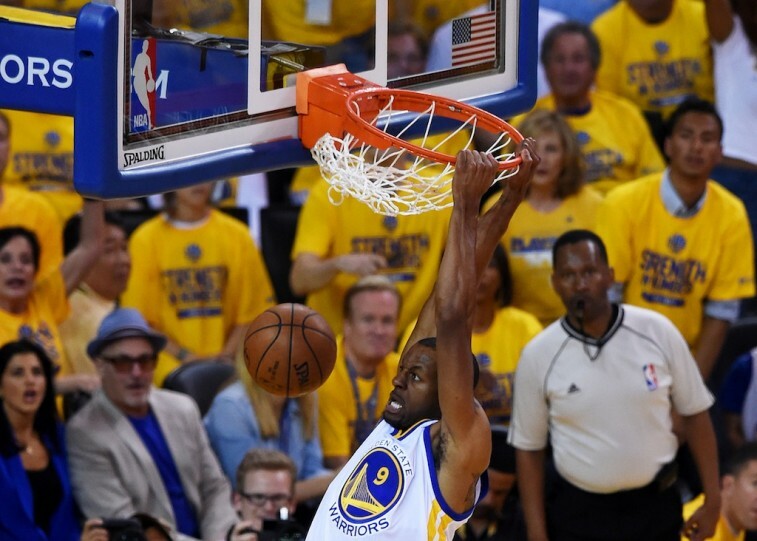 If you don’t think Iguodala is starving for an NBA championship, then you clearly weren’t paying attention to Game 1. His 15 points off the bench provided a major spark for the Warriors. Iggy was 6 for 8 from the field and 2 for 3 from three-point range. He even knocked down a triple while wearing only one sneaker. It was pretty boss. And yet, his scoring represent just part of his overall contribution on the night. The 11-year veteran was all over the floor; grabbing rebounds, picking pockets, dropping times, and adding a block for good measure. But where he truly shined was on the defensive end of the floor. 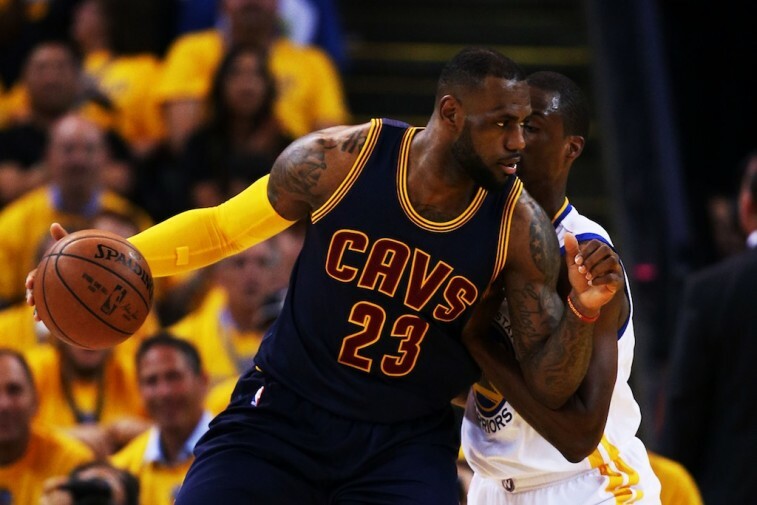 Out of the entire team, Iguodala had the most success guarding LeBron James. The King had 27 points, on 54.5% shooting when bodied by anyone not named “Iguodala.” However, when No. 9 was on James, he only scored 11 points, while shooting 28.6% from the field. We expect this matchup to continue well into the series. The Cavaliers are a young bunch. James knows this. The Cavaliers are banged up. James knows this. The Cavaliers need their king to lead. James knows this. Frankly there is nothing you can say about the Cavs that James doesn’t already know. Which is why he is prepared to be the aggressor the entire series. You could see it in his eyes. If he has to carry Cleveland to victory, then that’s what he’s going to do. James took it to the Golden State Warriors, dropping 44 points on 18 for 38 shooting. He got into the post. He took difficult fadeaways. He didn’t hesitate to pull the trigger from the outside. Unfortunately, his performance wasn’t enough to lead Cleveland to victory. But this is how he has to perform if the Cavs are going to stand any chance of pulling off the upset. You don’t have to tell James that. He already knows.